this flag represent me in my life. In the bigen I would like to talk about color. The last thing I talk about is the symbol that I use in the middle. so this thing mean sound of the Letter (Z) in English and in my language (Berber Letter) (ⵣ). This is my personal flag. The star represents hopes and dreams. Whatever hopes and dreams I want to accomplish such as becoming someone valuable and successful in the future, that's where the star represents me. I choose the color of star to be yellow because it represents power. What I mean by power is when we came to the U.S., as a young people and even an adult, we have the power to control ourselves. We have the power to do what we want and what we thing is thing. Me personally choose thing because it represent me as a young man who has power to make change in this planet. I choose the background to be read because it represents strengths. We have the strength we go where we want to go and do what we want to do because what's the purpose of coming to this country. Coming to this country and having strengths to do what we want. No everyone has the same purpose, but this means for a lot of people. The book represents education. Before becoming successful, I need a lot of education. Just like before reaching the star, it takes a lot of time and effort to become on to of the world. What's exactly what the book represents. If you have an education, you can reach whatever you want to reach. Thoughts that I have about making my personal flag this week is to make A simple that represent me and my family or my religion to show to the people and add a little of colors that can make it beautiful. Something I saw was water, mountain, fish, grass, dogs, people, golden gate, trees, graffiti, boat and rocks. something I did of art in albany bulb was I did grafitti. For example I drew a heart with spray paint. Also I painted the rocks. I want to make a flag of a symbol that represent me and my family I might use 3 or 2 colors. Moh picture from our trip to Albany Bulb. this is some picture I take and I like it very very much in in Albany Bulb. so in this picture I see people are drink alcohol, I think his life are passed very hard. some thoughts that I have is use 4 color: red, blue, yellow, green and use the liter (Z) with my language berber. When I want to Albany Bulb something I saw are dogs swimming in the ocean, people, trees, a lot of clouds, and sand. Art that I add some graffiti that is a moon sign next to the moon is a star. Thoughts I have about making my personal flag this week is making a good simple that represent me. And add a little of colors in my personal flag. In Albany Bulb I saw many different types of trees. I added a picture of me that I took on top of a tree, so you can see what I saw in Albany Bulb. The things that I saw in Albany bulb gave me an idea to make my personal flag. In which I will make my personal flag of a tree that represents myself because I love trees and I would love to make my own personal tree flag that represents myself. When I went to Albany Bulb trip I saw a bunch of rocks with drawing on them and a lot of dogs. In Albany Bulb I did sketching a tree that I saw around the beach. I think my personal flag will be a butterfly because that represents OIHS. The flag making class went to Albany Bulb last friday. My first impression of the place was how hard is to get to the place. 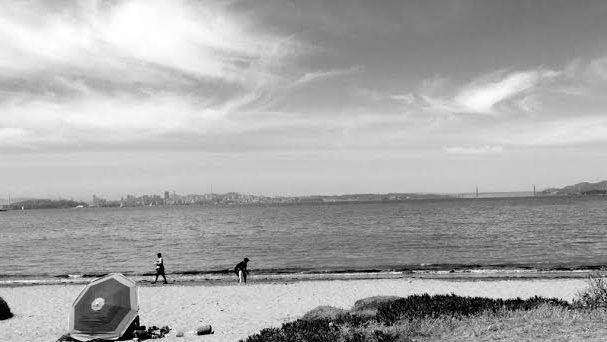 The beach in Albany Bulb surprisingly is visit for many people in the Bay Area. It was funny how people brought their animals to hang out at the beach. The art in Albany Bulb have a lot of different graffiti art. I got to made to my own graffiti in one of the rock near to the beach. I liked Albany Bulb. This week we starting to make our personal flag and I feel eager to make one. This is one of the graffiti that I made in Albany Bulb. I like animals so I made a bird graffiti. In Albany Bulb, I saw many graffiti on the rocks on the coast. People used many colors and they made different pictures. For example I saw white monster with 7 teeth. It looked so silly. Later I might add an animal in my personal flag. Something that I saw was the Golden Gate bridge, dogs they were swimming and a lot of sand. An art that I added was I drew the half of the Ocean and a lot of rocks around. Thoughts I have about making my personal flag later this week is to make a smell symbol and 2-3 colors. In this drawing, I see a man smoking like a old style. When I got there, I add a sign of Quality. And I explained why it's important to be equal in the video I published on Instagram. I said this symbol represents quality because it shows that each side have equal stuff to carry. It's balancing. Nothing goes up and down. Just like human being, doesn't matter your color, races, gender, ethnicity, we all should be treated equally under the law just like the first Amendment of the U.S. Constitution. I think my personal flag would be a sign of quality like the balance color of red and background color of yellow. Or maybe, a sign on an eagle flies really high up the sky and try to reach the star. On Friday in Albany Bulb I saw a lot of different paint and drawing on the rocks. I added my name sign on one of the rock. But the picture I have now is someone else I took picture of this art because when at the first I saw this picture. I thought this art whoever is it represents a lot of feelings, such as strong and angry. We have one more week to make our own personal flags. I think I will like to make a flag that would say SWB which stands for Soccer Without Borders. The circle represents gender equality. The red color shows love. The blue color demonstrates happiness. The black color represent negativities especially about women. We shows this color because people says a lot of negative things about women, so we used black color to show that women also deserve a special place. The white color portrays peace. We used the yellow color for hope to bring changes in the world by creating this peaceful flag. And the way all the pieces together it is a peace symbol. It shows my five brothers and sisters and love between family. I like this because it describes my family in a single symbol. Hi my name is Urias Gonzalez and I am a senior student at Oakland International high school. This symbol that I create with my group ideas represents all of the different cultures i Oakland. The lines represent each type of cultures with different paths toward their future.